While Sihanoukville airport has been upgrade to accommodate a traffic of 500,000 to 600,000 passengers a year. An expansion which could soon be to small as new flights are being added almost every month. Difficult to believe. Just five years ago, Sihanoukville was a totally insignificant airport, receiving a couple of charter flights a year. In 2013, the airport on Cambodia coast in the Southern part of the Kingdom recorded less than 20,000 passengers. Last year, Sihanoukville already accommodated 338,000 passengers while half a dozen airlines propose regular flights. This represented a jump in total passengers of 115% compared to 2016. And it is more than likely that traffic will exceed 400,000 passengers this year. According to a release from the Cambodia Airports company, the French-Malaysian joint venture which manages the Kingdom’s three international airports, Sihanoukville airport’s renovation is part of an ambitious plan to upgrade all air facilities in Cambodia to cope with quick developing traffic. Last year, Cambodia three airports handled close to nine million passengers. Attending the soft launching of the new Sihanoukville expanded terminal were the Secretary of State in charge of Civil Aviation, the Under-Secretary of State in charge of Tourism, the Governor of Preah Sihanouk Province, along with Mr Nicolas Notebaert, CEO of VINCI Concessions and President of VINCI Airports, the head company of Cambodia Airports. The extension and renovation of the terminal are part of an ambitious development program scheduled to be rolled-out in anticipation of traffic build-up in the coming 5 years. Main works involved the increase of the building surface by 80% (now totaling 4,800 square meters), its total revamp (in particular for the check-in area, boarding lounge, and baggage claim zone), and the installation of new equipment including an upgraded Baggage Handling System (BHS). In addition to the enhanced overall comfort, passengers can take advantage of the openings of new food & beverages outlets operated by local and international brands such as The Monkey Republic, Blue Flight and Plaza Premium Lounge. Another major project will soon be launched and aims at extending by 800 meters the airport’s runway to reach 3,300 m, a length sufficient to accommodate larger aircraft, especially from middle-haul and long-haul markets. Taing Sochet Krisna, director of the Tourism Department in Preah Sihanouk province, told to newspaper Khmer Times that the renovation of the terminal was a natural outcome to Sihanoukville increasing popularity as a tourism destination. “Our policy is to attract more and more tourists as well as investment into the province, and, in this regard, the renovation of the terminal of the airport is key to the provision of a better and more convenient service,” he said. Mr Krisna said last year his province saw almost 2 million tourists, 500,000 of which were foreigners. 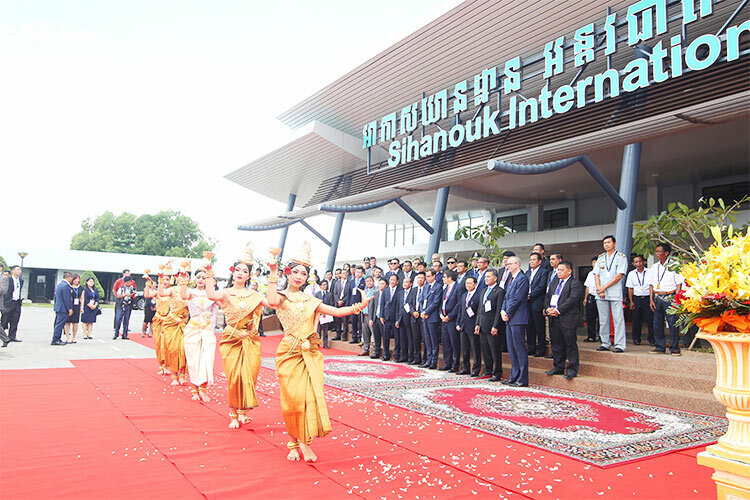 Sihanoukville Airport has seen its connectivity boosted by the launch of new flights over the last two years. They are now half a dozen airlines connecting Sihanoukville to China, the lastest one being Ruili Airlines which launched its first international route last March from Kunming to Sihanoukville. They are also regular flights to Malaysia with AirAsia flying to Kuala Lumpur as well as of Cambodia Angkor Air which flies to Ho Chi Minh City.